Who doesn’t love Facebook Live??? Audrey and I can’t seem to get enough! It’s just such an amazing way to interact and tell a story. We really love it. If you love Facebook Live, too, or haven’t participated in one yet, then I have the event for you!!! Tomorrow, March 8th, Audrey and I will be hosting a wonderful Facebook Live event with Pampers at 2 PM ET!!! 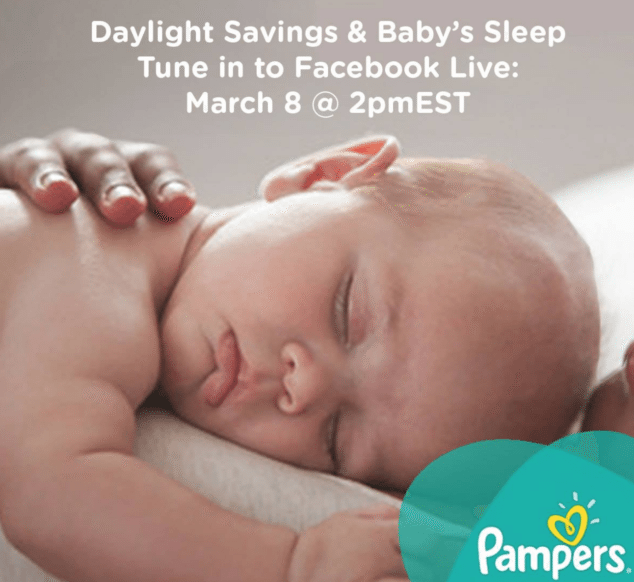 We will be discussing a very important issue we all face as parents – managing your child’s sleep through Daylight Saving Time (DST)! If you can believe it, this weekend we all “spring ahead” which means we lose an hour of sleep. While that may not seem like a big deal, it really can be. Did you know DST can effect a child’s sleep patters for over a week after the time change? We’re going to talk tips to manage the weekend and maybe make your life a little bit better. Audrey and I have 8 kids between us and we know this drill all too well. We will be sharing our experiences and will be hosting an incredible Sleep Expert with us who can answer questions and speak to any concerns you have for DST! This is going to be so awesome. Audrey and I literally CAN NOT WAIT for this. I hope you can join us! This FB Live is being hosted in partnership with Pampers. All opinions expressed at or related to the event are my own. This sounds like it’ll be a great chat. I LOVE the bay-bahs! I wish I could make the chat. I hope it’s a good one! Sounds like a can’t-miss event on FB live! I am sure it will be a good resource for new parents! I haven’t participated in any event before. Pampers is a trusted brand. I used this when my kids were babies. Hope the event went well. I know a lot of parents hate Daylight Savings Time because it throws off their kids’ sleep schedule.